Palestinian medical sources reported, Monday, that a worker was mildly wounded by Israeli army fire near the northern border of the Gaza Strip. The sources stated that the army opened fire at several workers near Beit Lahia wounding one worker in his left leg. The worker, identified as Suleiman Abu Rkab, 20 years old, was moved to Kamal Adwan Hospital where he received medical treatment. 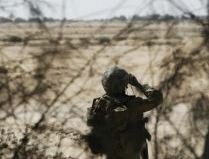 At least 120 workers and farmers have been injured by army fire along the northern and eastern borders of the Gaza Strip as the army prevents the Palestinians from approaching any border area in Gaza. The buffer zone was imposed on the Gaza Strip by Israel following the Oslo Accords, set at a distance of 50 metres. By 2010, the zone had been expanded to 300 metres, although in reality extends much further, with Palestinian residents of Gaza having come under Israeli live munition fire up to 2 kilometres away. A 2010 UN report estimated that approximately 30% of Gaza’s agricultural land has been rendered useless, or puts the property owner at significant risk of harm if they choose to work their land. Israel’s actions have devastated the agricultural industry, relied on by the residents of the Strip both economically and as a much needed source of fresh food since the State of Israel imposed a blockade in 2007. Following the blockade Israel has imposed strict regulation of products, including food, that are allowed into Gaza, both limiting the intake of fresh, healthy food, and the overall calorific quantity of food allowed into the Strip.